Chocoholics Beware. One spoonful of this Chocolate Mousse and you will be hooked forever. It is what you could call a grown up chocolate pudding. A simple yet elegant dessert. While it uses only a few ingredients, its chocolate flavor is rich and its texture is silky smooth, airy, almost foamy. And foamy is an apt description as "mousse" is French for 'froth' or 'foam'. Now, there are chocolate mousse recipes that simply involve folding whipped cream into melted chocolate. Good, yes, but to make a sublime chocolate mousse with that lovely "mouth-feel", you also need egg yolks, whipped egg whites, and whipped heavy cream. Since there are so few ingredients in a chocolate mousse, the chocolate you pick is very important. Use a good quality semi sweet or bittersweet chocolate that you enjoy eating out of hand. My personal preference is a semi sweet chocolate containing around 60% cacao. When choosing a chocolate, always look for one that has a lovely shiny finish (a sign that the chocolate was cooked at the right temperature for the right amount of time) and one that has that wonderful 'snap' when you break it into pieces. To make a classic chocolate mousse, start by melting chocolate with a little coffee and butter. Once cooled to room temperature whisk in the egg yolks. Next whip the egg whites with a little sugar until stiff peaks form. Then whip heavy cream with a little vanilla extract and sugar until soft peaks form. Then just fold the whipped whites and whipped cream into the chocolate and you are done. Now, this recipe does use raw egg yolks and whites so the eggs should be very fresh with no cracks in the shell. However, if you are worried about salmonella, you can leave out the eggs but still make this dessert. You do this by first melting the chocolate with the butter and coffee. But do not whisk in the egg yolks as stated in the recipe and do not add the beaten egg whites. Instead just whip the heavy (whipping) cream (double cream) (35-40% butterfat content) and gently but quickly fold the whipped cream into the melted chocolate that has been cooled to room temperature. A chocolate mousse without eggs still has a rich chocolate flavor and creamy smooth texture, but the texture does not have that light and airy (foamy) quality to it. 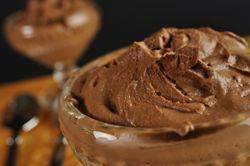 This chocolate mousse can be used to fill cakes or tarts. But my favorite way to enjoy this dessert is to scoop it into wineglasses, parfait glasses, teacups, custard cups, pretty bowls or glasses. You can garnish with whipped cream, shaved chocolate, and/or fresh raspberries. It can be served straight away or it can be placed in the refrigerator for a few hours. Chocolate Mousse: In a medium-sized stainless steel bowl set over a saucepan of simmering water, melt the chocolate, butter, and coffee. Remove from heat and set aside to cool for a few minutes. Then whisk in the two egg yolks. Cover and refrigerate while you whip the egg whites and whipping cream. In another bowl, whip the heavy cream, remaining two tablespoons sugar and vanilla extract until soft peaks form. Remove the chocolate mixture from the refrigerator, and gently stir a couple of spoonfuls of the beaten egg whites into the chocolate mixture to lighten it, and then fold the remaining whites into the chocolate mixture, gently but thoroughly. Fold in the whipped cream. Makes 6 servings. Preparation time 20 minutes. Bittman, Mark. How to Cook Everything. Macmillan. New York: 1998. Kimball, Christopher. The Dessert Bible. Little, Brown & Company. New York: 2000.